Ask a Savile Row tailor and they will tell you that patterned suits mean pinstripes, checks and maybe jacquard. Ask Gucci what it means, though, and you’ll get an entirely different answer. Since Alessandro Michele took over as the Italian brand’s creative director suddenly in 2015, its reinterpretation of what a suit – and more specifically a patterned suit – can be has breathed new life into an old format. But no one said it would be easy. Michele’s vision is bright, floral and realised in technicolour. Sound a bit tricky to wear? Just follow these eight steps to become a pro with pattern. Patterned suits are the opposite of their staid, pinstriped cousins, so let’s get the obvious stuff out of the way early. They are not, on the whole, for the workplace or funerals. On these occasions, the way you dress should be a sign of respect, rather than a distraction. There are exceptions, of course, and maybe you will one day be invited to Lady Gaga’s wake, but in the meantime, save the pattern for informal weddings, parties and nights out that demand you make an effort. In the same way patterned suits aren’t office-appropriate, they’re also probably a bit much for a Sunday at your local pub. Listen up, because this is where your ornamental style statement lives or dies. If the colour of your ensemble doesn’t suit you, the added detail will only make things worse. Or to put it another way, if a grey suit doesn’t usually look good on you, an all-over Jackson Pollock mural isn’t going to make any difference. With that in mind, search for an example in a colour you like (and likes you) first, disregarding all patterns until you find the right shade. If you’re at a total loss, or just want to play it safe, monochrome suits look good on just about everyone, regardless of the motif they bear. You’re still reading, so we can assume you’re fairly open to the idea of straying from your style comfort zone (congratulations), but by how much often varies from person to person. If you’re more minimalist wallflower than bird of paradise, opt for small micro-patterns in shades similar to the base colour of the suit to minimise contrast and ease yourself in. Remember that you should wear the suit, not the other way around – if you feel uncomfortable it’ll show, so tone it down. Keep in mind that, generally, small, subtle motifs fit the bill for sophisticated and dressier occasions, while larger, more vibrant designs lean casual and are likely to command a great deal more attention. Good news for whippets, less so for anyone who doesn’t skip leg day: it’s unlikely you’ll find ornately decorated suits in anything other than fashion cuts i.e. rake-thin. If you do, though, be aware that any sizing issues will be amplified by a pattern. If the jacket pulls at the buttons, for instance, the pattern will warp and draw attention to the offending area. It’s also worth bearing in mind that as it’s meant to be worn less formally, a suit like this could work with trainers, but only if you get the length of the trouser right. An easy rule of thumb is that one should never touch the other, so if you’re planning on wearing it off-duty, ensure your trousers stop on, or just above your ankle. If this guide were being written 10 years ago, suggesting trainers to accompany a suit might have been bad advice. Not much has changed design-wise since then, but there has been a relaxing of rules instead. People have realised that slim trainers can look good at the bottom of tailored trousers. Nowhere is that more relevant than with a statement suit. Sure, patent Oxfords will work, but wearing a pair of clean white kicks will look just as good – if not better – because it fits the relaxed style of the suit. If you don’t want to go all out, find a shoe that’s half way between the two, like Chelsea boots, suede Derbies or loafers. A vibrant patterned suit is such a statement of intent that really, trying to find a shirt to compete with it is like pushing a boulder up a hill and watch it roll back down, again and again, forever. 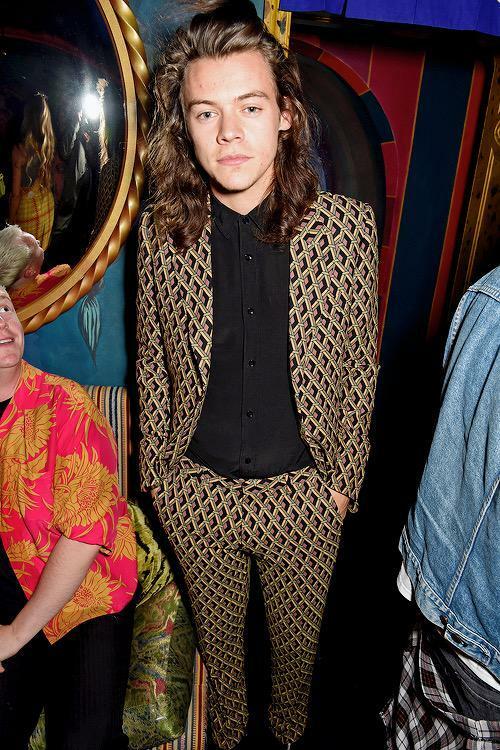 At this stage we defer to Harry Styles (and whoever’s been dressing him). A big Gucci fan, evidenced by several appearances wearing the brand’s shoutiest suits last year (see exhibits A, B and C), he took the sensible step of wearing a plain black shirt, buttoned to the top. Couldn’t be simpler, could it? If you want to dress it down, swap the shirt for a T-shirt instead but try tucking it in. A well-cut pair of suit trousers should sit higher up your body than jeans, to create a sense of proportion and in turn make you look taller. Tucking your T-shirt in will help to emphasise the effect. Over accessorising is one of the most sartorially sinful moves you can make; even more so when pattern is in play. It goes without saying that the suit should be the focal point here, so save the statement slippers and gaudy lapel pins for another time. Where your tie is concerned, keep it fuss-free and simple. Not ready to go full pattern just yet? You can, of course, split a patterned suit in two and wear the jacket with plain trousers (we wouldn’t advise doing it the other way around unless you’re intending to play golf). In this case, look for the darkest prominent colour in the jacket, be it navy, grey, black or even burgundy and try to find trousers to match. Failing that, a pair of solid black trousers will work across the board.